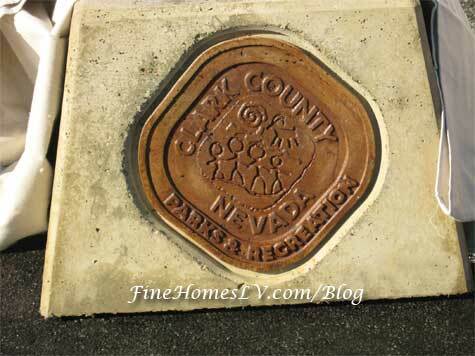 At a special event this morning, Realm of Design Inc. presented the Cities of Henderson, Las Vegas and North Las Vegas, as well as Clark County, Nevada with park benches made out of eco-friendly architectural green stone. The green stone is an invention of Realm of Design and is made from 99.8 percent renewable materials, including pozzolan cement and 100 percent glass aggregate, with glass recycled from Mandalay Bay and Luxor Las Vegas hotels. Held in front of the company’s new manufacturing facility, with an exterior facade also made of the green stone, Realm of Design founder Scott McComb’s addressed event attendees, reminding them of the importance of glass recycling and encouraging citizens throughout the Las Vegas Valley to recycle glass. Officials participating in the event were City of Henderson Councilwoman Kathleen Boutin; City of Las Vegas Sustainability Officer Thomas A. Perrigo; City of North Las Vegas Councilman Richard J. Cherchio; and Clark County, Nevada liaison to Commissioner Steve Sisolak, Tiffany Hesser – each speaking to attendees about their entities sustainability efforts. Rob Dorinson, president of Evergreen Recycling, also engaged participants about Evergreen’s mission throughout the Valley. Following remarks from the speakers, McComb’s presented all three Cities and the County with a gift of a green stone park bench, each personalized with the seal or logo of the individual municipality. Each individual bench utilized 587 and a half pounds of recycled glass. McCombs spent more than three years developing and perfecting the green stone. More than 500,000 pounds of recycled materials, including 290,000 pounds of recycled glass, was used in the construction of the exterior facade of the company’s new manufacturing facility. The design of the new building was inspired by the Swarkestone Hall Pavilion in England—the location of one of The Rolling Stones most famous photo shoots. “We are excited to offer the green stone to our clients, giving them an opportunity to create their own design vision while being green and helping the environment,” said McCombs. Realm of Design is also offering the innovative and environmentally friendly green stone to its clients. The green stone can be developed into several interior and exterior architectural elements including: columns, balustrades, fireplaces, mantels, flooring, wall sconces, fountains, domes and gazebos, among others.